US Airways' Frequent Flyer scheme is called Dividend Miles, and is part of the Star Alliance. 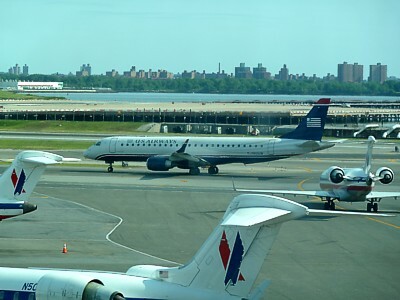 The US Airways' Dividend Miles programme is similar to most other Frequent Flyer schemes, with slight lower levels of mileage needed for elite status than some other schemes. Dividend Miles is also well known for its offer of generous bonus promotions, such as the recurring "Grand Slam Promotion" where members can earn up to 50,000 bonus miles for completing activity with partners. The overwhelming perk that most people love about the scheme is the way it gives away free upgrades to anyone with even the most basic of status. Other than that, the scheme if good if you want Star Alliance Gold status for a low mileage level, and you never travel to the US: you don't get free lounge access in the US unless you are Chairman's Preferred (although it is good to see that US Airways does at least make it free here - no other US scheme does). These scheme however has a poor earn/burn ratio. Business and First tickets on Star partners are very expensive. Joining is easy; it's possible to do it online, although the joining process is convoluted with three pages of forms to fill in, and various bits that are mandatory that are not made clear. You get a membership number as soon as you sign up, however you don't get a 'real' card until you've flown on US Airways at least once. The scheme's slogan is 'get everything smart travellers love'. However US Airways don't seem to realise that many people like information, and the information online about the scheme is patchy at best, and very badly written. You may also see reference to America West Airlines frequent flyer program called FlightFund. Following the US Airways-America West merger, FlightFund was merged into the US Airways Dividend Miles scheme. You will earn 100% of the miles you fly, even on the cheapest flights - this is some perk, considering most frequent flyer schemes exclude cheap tickets. If you have even the slightest whiff of status you earn at least 500 miles per segment (and you always earn 500 miles on US Airways Shuttle flights). There is a bonus over this depending on the class of travel, but it isn't very generous. First class domestic, and and Envoy Class (the equivalent of business on transatlantic flights) earns a 50% mileage bonus. In addition to US Airways partner airlines in the Star Alliance, the Dividend Miles program other partner airlines or programs include some wacky alternatives, such as Bahamasair, Hawaiian Airlines, Qatar Airways, Royal Jordanian Airlines, Virgin Atlantic Airways and Jet Airways of India. US Airways Dividend Miles has been restructured. It has four award levels: Off-Peak, Low, Medium and High. Low award tickets are very limited, and not even Preferred members are exempt from blackout dates. You can't book a one way, but you can combine coach, first and Envoy cabins or Off-Peak, Low, Medium or High when booking award flights. A domestic roundtrip coach award ticket is 25,000 (Low), 40,000 (Medium) or 60,000 (High). A domestic roundtrip award in first class on US Airways is 50,000 (Low), 80,000 (Medium) or 100,000 (High). Award flights to Hawaii in coach are 40,000 (Low), 65,000 (Medium) and 90,000 (High) and 70,000 (Low), 135,000 (Medium) or 180,000 (High) in first class. Award flights to Europe in coach are 60,000 (Low), 90,000 (Medium) and 125,000 (High) and 100,000 (Low), 200,000 (Medium) or 350,000 (High) in business class. Why have three when you can have five? Dividend Miles has no less than five status membership levels, giving differing levels of perks, although the most significant is your level in the pecking order of upgrades. Other than that, the biggest jump comes at Gold level, when you get access to the lounges. Status is worked out over the calendar year, as opposed to having personal membership years: for this reason there are a lot of members who fly a lot in the second week of December (before the Christmas rush) to get their status up for the following year. US Airways tend to give out upgrades rather like sweets to anyone with even the slightest status, but only to their own members. A Star Alliance Gold will come lower in the pecking order than a US Airways Silver. Upgrades are processed automatically by what frequent flyers call the 'Upgrade Gnome'. It's an automated computer program that runs twice a day, checking bookings, and processing upgrades according to status. First to be upgraded will be Chairman's Preferred, 7 days before the flight, and last will be Silver, a mere 2 days before the flight. You'll get an email confirming if your upgrade worked. Beware that Star Alliance Golds on any other scheme will not be recognised by the Gnome. You may have some success in calling the reservation line at 3 days before the flight, but this is a matter of luck. Otherwise you may, again, get lucky at check in, but this is a real gamble. The First cabin is normally full at this point, and also this is dependant on US Airways recognising you as a Star Gold anyway: this may be a particular problem if you are a member of the bmi Diamond Club. The only exception to this is if you buy a fully flexible (Y/B ticket bucket) North American fares, in which case you'll get an instant upgrade. However these fares are so expensive, it may be cheaper to just buy a cheap First class seat, and earn the extra miles, and then pay the change fee if you need to. Offering a few - a very few perks is the basic general membership level. Most people are at this level: indeed, all the members who earn miles through the credit card are. US Airways Silver Preferred is equivalent to Star Alliance Silver. To get to this level you must fly at least 25,000 miles or 30 segments during the calendar year. The perks at this level are fairly basic, but you do get instant upgrades on Y/B North American fares, and complementary upgrades 2 days prior to departure on all other North American flights. There is the ability to reserve 'choice' coach seats. Free 1st and 2nd check bags. 25% mileage bonus. 500-mile (800 km) minimum mileage earned. There is also use of the priority line, with priority check-in, baggage, security screening, and boarding. Free Stand-by. There is also a kind of 'Silver and a bit' level. Members who reach 35,000 miles or 45 segments are given one day pass to the US Club, the ability to nominate a friend to trial Silver preferred, and special offers from partners. US Airways Gold Preferred is equivalent to Star Alliance Gold. To get to this level you must fly at least 50,000 miles or 60 segments during the calendar year. Now we're talking - you get worldwide lounge access thanks to the Star Alliance Gold status. This is a perk really worth having, but it doesn't apply in the US, which really shoots this level in the foot. You still have to buy access to the US Airways Club, and there is no access to the United Red Carpet Clubs either. If you're only going to make Gold, it makes much more sense to pile your miles into a scheme outside the US, which will give you Gold access and then you do get free access to the clubs. Complementary upgrades 3 days prior to departure on all other North American tickets. Other than that you'll get the silver perks, plus three free checked bags, and 50% mileage bonus. There is also a 'Gold and a bit' level. Members who reach 60,000 miles or 75 segments get to add a spouse to their US Club membership at no cost and receive more special offers from partners. To get to this level you must fly at least 75,000 miles or 90 segments during the calendar year. US Airways Platinum Preferred has no equivalent Star Alliance status, but comes with Star Alliance Gold. Complementary upgrades 4 days prior to departure on all other North American tickets. Other than that you'll get the gold perks, plus a 75% mileage bonus, and guaranteed seating on all flights. This isn't such a throw away perk as you'd think: it means you can get onto completely oversold flights. The 'Platinum and a bit' level comes at 85,000 miles or 105 segments get the right to nominate a friend to Silver Preferred status and first class travel on award tickets. This is the top tier. To get to this level you must fly at least 105,000 miles or 120 segments during the calendar year. US Airways Chairman's Preferred has no equivalent Star Alliance status, but comes with Star Alliance Gold. Complementary upgrades 7 days prior to departure on all other North American tickets. Other than that you'll get the platinum perks, plus a 100% mileage bonus, and four systemwide upgrades. The absolute top tier comes when you reach 125,000 miles or 150 segments. Here you finally receive a free US Club membership and the right to nominate a friend to Gold Preferred. For every additional 25,000 miles or 30 segments that members reach, they can nominate another friend to Gold Preferred.